" GA Sec. 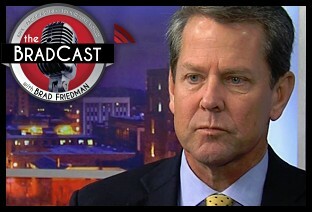 of State Kemp Caught on Tape Worried 'Everybody May Exercise Their Right to Vote': 'BradCast' 10/23/2018	"
Rolling Stone releases audio of Georgia's Republican Sec. of State and gubernatorial candidate Brian Kemp, from a private campaign fundraising event last Friday, in which Kemp, the state's chief election official, is heard lamenting that his Democratic opponent Stacey Abrams is spending millions on GOTV efforts which, he says, "continues to concern us, especially if everybody uses and exercises their right to vote." « PREVIOUS STORY "'Green News Report' - October 23, 2018"
"GA Sec. of State Kemp Caught on Tape Worried 'Everybody May Exercise Their Right to Vote': 'BradCast' 10/23/2018"
I heard the audio on my drive home from work yesterday on the SIRIUS Progressive Channel program hosted by Michaelangelo Signorile. I can't get the actual audio itself because it is likely that no one will host it. But finding it should be possible with BRADBLOG's massive resources (that's you, Desi!). If you find it, I --- as an African American --- vote for you to broadcast it. I think people need to hear it to believe it. As we say, it's gettin' real up in here! This would have been a great episode to play that Paul Weyrich quote about voting as the lead-in. I recommend you play that whenever such a topic arises.